Programs to help you start your La Trobe journey with the skills you need to succeed. Orientation is the official start of the semester. Feel prepared for university and succeed in your studies. Get familiar with your campus, make new friends and get yourself set up for the year before classes start. Ready4Uni is designed to help you prepare for studying at La Trobe. Find out about academic techniques for learning, tips for success, how to make friends though clubs and societies, support services, and much more. Each module will take approximately 20 minutes to read and complete all the activities. Prepare for your first week at University. Find out what you can expect in your course. ASK La Trobe, your one-stop help service. 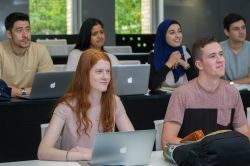 The Academic Integrity Module will teach you about La Trobe's values and its academic integrity standards so you can avoid academic misconduct. Prepare for university study, and learn to plan, write, read, take notes and reference. "When I was at TAFE I was not aware of credits. It never occurred to me." If you have previously studied at another higher education institution, like TAFE or another university, you could get credit (Advanced Standing) towards your La Trobe degree. Coming back to formal study can be a challenge. Your greater life experience can be a success factor. Use the resources on this page to succeed. Welcome to uni! Take these steps to make the transition from TAFE to uni as smooth as possible. Find out if you are eligible for Credit for Previous Study. Visit the Learning Hub to understand university academic skills. "TAFE focuses more on being work ready, and uni is more on theory." Find about how how to survive your subject or degree with Survival Guides. Take the next steps to understand assessment tasks, what learning looks like in your discipline, grades, referencing style, managing group work and more. Talk to your lecturers and tutors during consultation hours.